Summer is fast approaching, and you are thinking of surprising ways to spend your time. Does the top of your list among these include fly fishing and you have no idea about this amazing sport? To get you started, you should know that unlike regular fishing, fly fishing requires specific equipment and lots of practice to perfect the art. This article guides you choosing the best fly fishing rods. Success in the sport is highly dependent on the kind of fly rod that a fly fisher opts for. Once you settle your mind on fly fishing as one of the must-do activities and set out to buy a fly rod, you should drift away from the popular belief that a high price means quality. Instead, look for a rod that mixes small investment with quality. For a beginner, the first purchase can be confusing due to the many fly rods available and the presence of many marketers, all looking to sell their product. To get the right product for you, you need to consider the following factors. Selecting a fly rod is based on many factors but this process will largely depend on where you are in your fly fishing journey. Are you a novice? If so you may want to pay more attention to rods geared towards beginners. Likewise, even if you are a beginner you may want to focus on a rod that you can use long term if you are absolutely sure you want to take up the hobby seriously. In general, I like to simplify the process by looking at four categories when deciding on a rod. I like to know that if I manage to get the bite that I can reel it in. I am not the most graceful when it comes to fly fishing; my style needs a bit more finesse, so I focus on rods that offer greater durability (usually). Strength in fly fishing comes from several sources, the rod type (whether it is mid or tip flex), the material the rod is made of, and a few other factors. It’s hard to buy a rod suited for you if you do not know your casting style. It is a common occurrence to find that beginners are not aware of their casting style. Therefore, you need not worry if you too have no idea about the same. All you need to do is cast some demo rods and establish which ones you do not like and which ones you do. It is essential to choose a rod that you can use with ease, and as such you want to focus on a rod that isn't too heavy. Like many things fishing requires patience and judgment, you need to be able to act quickly when the need arises as well. The weight of the rod all plays into this. The stiffness and speed of the rod you chose should be dependent on where you are going to do your fishing and the type of caster you are. Regarding stiffness and speed, manufacturers manufacture either a full flex rod, tip flex rod or a mid-flex rod. The full flex rod is best suited for a slow caster who loves dry fly fishing and fishing in small streams whereas the tip flex rod is for a fast caster who wants to throw bigger flies. The mid-flex rod, just as the name suggests, is best suited for moderate conditions. It is best that you chose a fly rod that matches the type of caster that you are. Accuracy is also critical in selecting a rod, in some rods if they aren't put together well the added friction can cause your casting accuracy to suffer. Efficiency can be pivotal in landing a catch and baiting fish. The type of water body where you plan to go and fish is a significant factor since it determines the kind of fly rod that you need to buy. If you intend to go to a river, it is essential that you establish its size. In connection to the location, you need to ask yourself if you foresee casting nymph rigs and streamers or primarily dry flies. A 4-weight fly combo is an excellent rod for small rivers and streams. It can throw light nymph rigs and streamers whereas the six-weight is adapted to handle more massive nymph rigs and streamers. The five-weight, which is between the two, can handle both setups well. To identify the right rod, you need to establish how manufacturers name them depending on their various properties. Manufacturers use a numbering system to help in pairing reels, rods, and lines. The most popular sizes are four, five and six weight rods. A smaller number denotes lighter equipment and vice versa. With the purchase of any product, it is always good to consider the price. A great buyer still goes for products that are within his or her budget. Fly rods have different rates with some going for approximately $800 while others go for $350 and below. The difference in prices is as a result of the variance of the brand, quality of components, weight, patents, and technology. For a beginner, the best rod for you is one that meets your budget after considering all the above factors. Do not break the bank for your first purchase but rather go looking for better quality fly rods as you mature in the field. With these four concepts in mind, we set out to take a look at Top 10 Fly Fishing rods and how they measure up in our search. Let's start by taking a look at below fly fishing rods and how they fare when compared to one another. The first in our list of fly rods is The Shadowfire fly rod which is very light weighing only 2.9oz. It allows you to cast near infinitely with minimal fatigue. The Dragontail fishing rod is also slender and durable, featuring a high-quality wooden handle and ultra-sensitive tip flexes that allow for accurate short casting. This complete starter kit is just Perfect for beginners and backpacking fly fishing activities. It is also easy on the wallet! Has everything needed for novice anglers. The Maxcatch Fly Rod is made of graphite carbon fiber and features a grade AA cork grip. MAXCATCH has a strong focus on durability as the rod made of solid carbon fiber construction. A fast action fly fishing rod featuring amazing strength with a lightweight design for ease of handling. The Maxcatch fly rod is 4 pieces and features medium fast action casting and average accuracy. All in all the perfect rod for all around fly fishing or beginners to practice their craft. This rod also works well as an all-purpose back-up rod. This rod is suitable for beginners and experienced anglers alike, and with a low price range, it is necessarily a significant investment if you plan to do a lot (or even a little) fly fishing. An Ultralight fly rod with amazingly smooth action. For beginners and the experienced/ perfect back-up rod. Priced under $50, the Piscifun Sword Graphite Fly Fishing Rod is a complete starter package for beginner anglers. It features a 4-piece 9-foot rod, a large arbor reel with drag, aluminum reel seat with double lock rings and much more. In fact, I used this very rod set when I began to learn fly fishing (brings back so many memories), which makes it perfect for those new to fly fishing. The rod features a mid-flex design which is great when learning the nuances of fly fishing and slow action casting (also helpful when just starting out). Depending on your rate of advancement you could outgrow this package sooner rather than later, but it is a good starting point that promises tons of enjoyable time getting acquainted with fly fishing. Durable build ensures no unforeseen issues with rod cracks or breaks. A well balanced quality build. Simple to use, perfect for beginners. The design allows you to align the guides easily and accurately. The Tailwater Outfitters fly rod perfect for novices who wish to fish in small rivers. It enables beginners to pin down their casting method thanks to its comfortable and smooth action half well, high-quality cork handle. The Taccoa Fly rod is pretty easy to set up with the help of alignment dots which helps to get the sections lineup in the first try. I was able to catch some very decent fish with Tailwater Toccoa Fly Rod. Do not get me wrong; this rod will not make you a fishing champion. However, it will give you the necessary tools to succeed. With anything in life, you can have all the skill but with the requisite tools, you won't be successful unless you have the right tools for the job. Travel-ready comfortable 4 piece fly rod. Comfortable cork handle won't let you burn out for longer casting. Affordable fly rod for all. Perfect for small streams and small fish. Fly rods can change the fishing landscape as a whole. I used Fenwicks AETOS 5wt fly rod on my most recent fishing trip. It had a very smooth feel to it. The sleek aluminum design was so light in my hand, but at the same time, I could tell it was solid.I could say that It is plain and definite the this is the best fly rod on the market under $200. The Fenwicks fly rod is best for long delicate casts. Its lightweight nature allows the user super control and accuracy. The fly rod is ideal for fishing medium and small dry flies.The Encounter is great in fresh and salt water environments but may require maintenance (cleaning) if you use it in salt as it may cause some buildup/corrosion. It also offers enough variety in set-up to be useful in most situations. Great fishing rod that has real action to be effective. Perfectly crafted fly fishing rod. The TFO fly rods have been refined and reinforced for maximum tension. This dramatically enhances the rod's tracking, accuracy and lifting power for catches. The rod's enhanced performance is mainly due to the materials used to craft it. Anodized reel seats with aluminum inserts are just one of the many high-quality materials used to craft the TFO braided graphite rod, and its focus is to be high-quality and provide the most enjoyable, effortless fishing experience possible. A very lightweight build. This offers very little arm fatigue and increased reaction time. Supreme Craftsmanship. The rod is very beautiful. Comfort and ease of use. The rod is designed with your convenience with grip and handling in mind. Comes with an optional TFO- logo red rock sock. The Redington offers smooth casting that is suitable for beginners, yet powerful and enought for boat fishing and big rivers. Its lightweight nature allows the user super control and accuracy. The fly rod is ideal for fishing medium and small dry flies. Blank made of modular graphite material. It has medium to medium action which is an excellent fit for presenting dry flies softly. Has a two year warranty for replacements. We are introducing the premier series of rods specially designed for making short and dynamic casts where the accuracy is far more important than range. You also need a durable, powerful rod that is preferably lightweight to shift the tides in your favor. This is where the G.Loomis warm water fly rod comes in, it offers a compelling, lightweight alternative to most fly rods and manages to be durable for extended use as well. The G Loomis fly rod best for short, delicate casts. Its lightweight nature allows the user super control and accuracy. The fly rod is ideal for fishing mangroves, thick covers, and shorelines. Comes with a travel rod sack and hard case for travel. Well balanced rod useful in many situations. 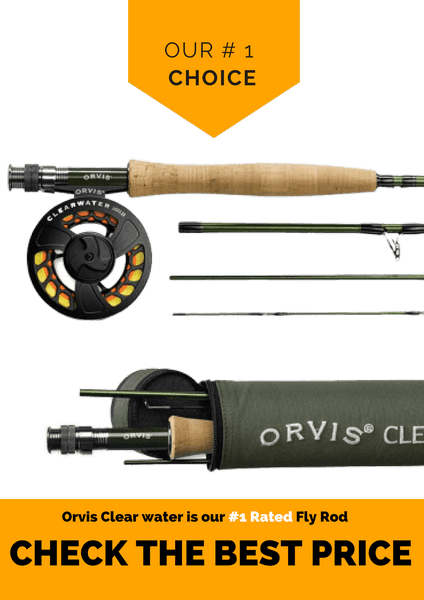 Orvis Clear Water Fly Rod is the ideal fishing rod for all needs. You can use it in the roughest waters from Alaska to Maine. At a reasonable price, the Orvis Clear Water Fly Rod puts every other fishing pole out of business. It comes with a warranty and an array of features. It comes in many different weights and sizes which are ideal for almost any fishing situation. The best situation it can be used for is the clear water Fishing, but it can be utilized for salt waters too. The rod contains an aluminum reel which gives it a lightweight feel while at the same time providing strength and durability. It has a four-piece design which makes it a convenient way to move on the go. The Orvis Clearwater fishing rod is also very pleasing to the eye because it is a breathtaking piece of equipment. The rod is equipped to make casting easy and fun. The customization design packages benefit the customers because each person could develop their perfect rod. Rod that is lightweight, durable and has a sleek design. A good fishing rod can make a beginner look like a pro. One of the best parts of this rod is the action. It isn't too fast or too slow. The high-quality material and its durability are truly special. It is more important that you invest in a fishing rod for the long term if you like fishing. The Headwaters Bamboo Fly rod is not the cheapest option in the market, but it is the most competitive in the long run. If you buy other cheap rods, in the short term, you might pay less for it, but in the long term, it will cost you a lot more because you have to pay for more rods. And if you want to experience the bamboo fly rod at a most affordable price, then this is the one for you. The Bamboo fly rod incredible accuracy stems from the fact that it allows for near effortless casting. It's lightweight composition also ensures that you can focus nearly 100% of your effort in hitting the mark. This fly rod is smaller than the other fly rods mentioned in this article but still performs like its most robust competitors. It is much more flexible compared to the graphite rod. Small yet amazing fly rod suitable for close action. Packed with a powerful medium fast flex action taper. Comes with a life time warranty. Professional fly fishing rods are pivotal for any serious fly fisher. You need to be able to react quickly and efficiently to land that catch. Fly fishing involves a lot of factors that you must judge fast such as how much power to use when reeling, accounting for line tension, reaction speed: the considerations can be near infinite. The Orvis Clear water offers a lightweight, durable and diverse set of uses. You are sure to enjoy a great deal of your time fishing with this rod and it offers enough accuracy to practice both long and short range fly fishing techniques.